These individual meat pies are also called cornish pasties. You can fill them with whatever cooked, ground or shredded meat and vegetables you' d like. We added frozen hash brown potatoes and ground hamburger in the pictures below. Seasoned with seasoning salt and pepper and served with ketchup. Other good combinations are hamburger, peas and carrots or shredded chicken and diced peppers and onions. Season with salt and pepper and whatever spices you'd like. Roll or lay pie dough out in a large circle. Cut into two. 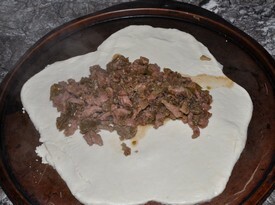 Place meat and vegetables on one end of the pie dough. Fold dough over and seal edges by pinching together and pressing with a fork. Place on a cookie sheet and preheat oven to 350 degrees. Cut two slits or poke holes on the top with a fork. Beat an egg in a glass and use a pastry brush to brush the tops of each mini pie. Bake for 15-20 minutes or until golden brown. An easy version of individual meat pies using chicken and crescent rolls. This recipe is like a chicken cordon bleu sandwich. Using crescent rolls, place a slice of ham, slice of cheese and a chicken breast on each crescent triangle. Roll up and seal the edges with a fork. Bake at 375 degrees until golden brown. 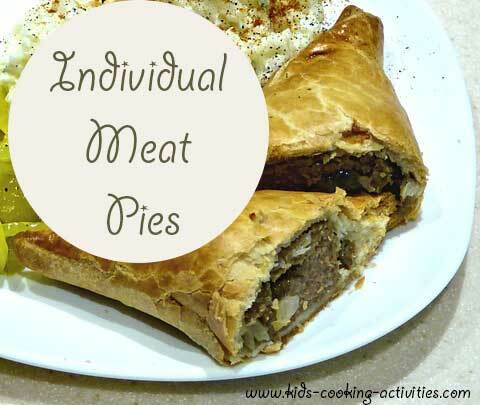 You can create these into family or individual meat pies. My family loves this when we go on a hiking trip or picnic. It's a quick and healthy meal on the go! 1. Cut each sirloin tip with the grain into 1-inch cubes. 2. Stagger the beef cubes in a single layer 6 inches apart between two sheets of plastic wrap. 3. Using a meat pounder, pound the cubes until paper-thin. 4. When you're done, the slices of meat should be almost transparent. Cook meat for 10 minutes, add can of french onion soup, salt, pepper, and diced bell peppers over a low to medium heat until done and most of the liquid has been soaked up. Lay out and roll out dough into a round 10-12 inch circle. Once meat is done, add meat mix to the center of the circle of dough (like you would a taco or burrito), be sure to leave about 1/2 an inch of space on each end of the circle. Then roll the dough up at the ends and roll the rest of the dough like a burrito. Secure the ends and middle with toothpicks to hold together. Place on cookie sheet and place in oven, Cook for approximately 45 minutes or until lightly browned. Remove from oven and allow to cool. Slice diagonally, but not all the way through, and wrap in tin foil until ready to eat. See some more filling ideas on our calzone recipes page. Do you have a recipe for Individual meat pies to share?